I mentioned in my recent ScanSnap iX100 Review that while the scanner is good, what made me fall out of my chair was the under-the-radar inclusion of a new software feature called ScanSnap Receipt. This is something that ScanSnap users have requested for a long time – the ability to scan a receipt and have the ability to categorize and export the data for taxes, expense tracking, and the like. The new ScanSnap Receipt application ships with the ScanSnap iX100, and it has started appearing via Online Update for ScanSnap iX500 and ScanSnap SV600 customers as well. I am told that it will be released for the ScanSnap S1300i in October. Update 09/21/2015: ScanSnap Receipt has now been released for Canada, and will be released in the EMEA region in Autumn 2015. See this post for details. One unfortunate note: Fujitsu has confirmed to me that ScanSnap Receipt is only available for the United States market. If you have a ScanSnap that is purchased outside of the US, ScanSnap Receipt will not appear for you in Online Update. Not cool. I’ll update this if this ever changes. ScanSnap Receipt is a separate application and is not built-in to ScanSnap Organizer, their document management application. The con of this is that if you use ScanSnap Organizer to manage your documents, everything is not tied in. The pro of this is that if you do not use ScanSnap Organizer, you still have the benefit of receipt management and extraction. Scan a receipt and select ScanSnap Receipt in the Quick Menu. Set up a ScanSnap Manager Profile for ScanSnap Receipt and use that to scan. Drag or import PDFs or JPGs in to the ScanSnap Receipt application itself. When you scan a receipt and have the Quick Menu enabled, it does a pretty good job of automatically detecting that it is a receipt and you should see ScanSnap Receipt in the Recommended section. If for whatever reason it doesn’t auto-detect that it is a receipt, not a problem. Just find ScanSnap Receipt in the list. A nice touch – if you use Quick Menu and you have the ScanSnap Receipt application running, it will keep scanning subsequent receipts to ScanSnap Receipt. You don’t have to keep selecting it. If you are not the Quick Menu type, you can set up a ScanSnap Manager Profile for your receipts. Just select ScanSnap Receipt on the Application tab. You can drag a PDF or JPG image into the ScanSnap Receipt window, or use File > Import. It will then process the receipt and OCR if necessary. To my utter shock and awe, this works for documents that were not scanned by the ScanSnap. I tested it out scanning with a few mobile scanning apps, both OCRed and not, and it happily imported them all. I was sure it would be locked down the way ScanSnap Organizer is. For organization, ScanSnap Receipt uses inboxes, and has one called My Inbox by default. Anything you scan or import will go there. You can create other inboxes for high level organization if you’d like. It would be nice if you could scan a receipt and have all the text detected perfectly and placed in the correct fields perfectly. Unfortunately with pretty much any OCR solution, that will usually not be the case. There’s often something you need to tweak. In my experience so far, I have found that it is great at detecting dates, amounts, taxes, payment method, and card numbers. The Vendor name wasn’t super successful, though that is often a result of wacky logos etc. It’s pretty hard for any program to know exactly which piece of text is the vendor. Fortunately, it is fast and easy to fix this stuff up. If you just need to make a quick edit, you can type it directly in the spreadsheet-like view of all of the receipts. 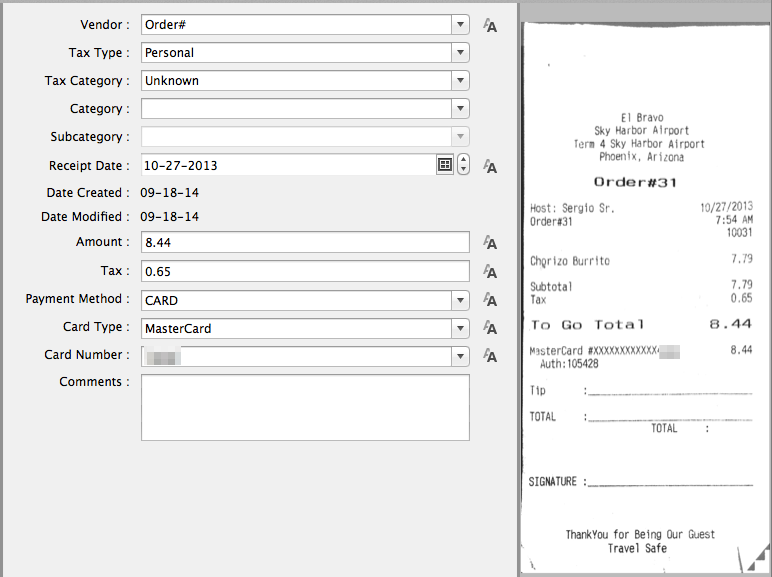 If you want to zoom in on an individual receipt, you can double-click it or select it and hit the Edit button. In this example, it has detected the date, amount, tax, and card of my unhealthy but delicious airport burrito, but it didn’t get the vendor right. Of course, I could just type in the correct name, but ScanSnap Receipt has a cool select-and-OCR feature. Just select a bit of text in the receipt and it will pop up a window asking which field you’d like it placed in. I highlighted El Bravo and chose Vendor, and it put the correct text in the Vendor field. Handy. ScanSnap has a way for you to keep track of which receipts you’ve gone through and edited. There’s a field called Unchecked that has two states: Unchecked and Checked. By default any receipt that is scanned/imported has a state of Unchecked. Once you’ve edited a receipt, it changes the state to Checked. You can, of course, change that back and forth manually. This is good to know if you are editing a receipt and all of a sudden it “disappears”. Chances are you have a filter set to only show Unchecked receipts. The software comes with a set of Categories and Subcategories that you can modify. There is only one level of subcategories, so your hierarchy is only one level deep. I have found the ScanSnap Receipt software pretty smart about automatically splitting receipts. If I scan two receipts with in one shot, it automatically splits them out to two separate receipts in the software. However, if you need to combine receipts or split manually, you can do this. To combine receipts, you can highlight the rows that you want to bring together, right-click, and hit Combine. When you do, it will bring the receipts together and sum up the amount and the tax. You can also split up a receipt. This is handy if you have different categories, or perhaps part of a receipt is for Business and part is Personal. For example, let’s take this receipt from Aunt Chilada’s. Perhaps my delicious carnitas tacos was a business expense, but I wanted the “Hand-Tossed Marg.” (whatever that is) to be a personal expense. I right-click the receipt and choose Split, and I can make those changes. Once you do that, the receipt goes back into the Unchecked state and you can go in and review the changes. A nice thing about having all these fields to work off of is you can do some slicing and dicing to see (and export) just the receipts you want. The key is the handy + button that lets you filter by your fields. Once you press that, you can add up to three levels of filters. So let’s say we wanted to find the tax deductible travel receipts. Boom. Of course, you can just search by keyword as well and it will search the OCR’ed text of the receipt. The point of using a receipt program isn’t to do all this work organizing receipts – you presumably want to do something with the information. You can export the receipts as individual PDFs, as one big PDF, as JPGs, or as a CSV file. In ScanSnap Receipt for Windows, you can transfer receipts to Quickbooks Pro 2012 or later. You need to connect it to the company file, map the data for transferring, and then you can move data over. You can export an individual receipt or the selected receipts, which is where filtering can come in handy. You can slice and dice the data exactly how you want it, and then export. You may find it helpful to check out the CSV that ScanSnap Receipts puts out. I’ve generated a Mac and Windows one just in case there are any wacky differences. Other than CSV/image export, there aren’t any reports that you can run from your receipt data. Here’s where things get slightly weird. As far as I can tell, all the receipt images and data is stored in a proprietary database. On the Mac, this is stored in ~/Library/Application Data/PFU/ScanSnap Receipt. On Windows, it is in your User folder under AppData\Local\PFU\ScanSnap Receipt. Make sure that your regular backup routine is picking up that storage folder. On some sort of regular basis use Tools > Backup to back up your database and keep that file safe. Proprietary databases make me nervous, so protect yourself. It isn’t 100% clear to me what Fujitsu’s intentions are around ScanSnap Receipt. Should people be storing their regular documents in ScanSnap Organizer and their receipts in ScanSnap Receipt? Is ScanSnap Receipt intended to be more “transactional”, where you dump your receipts into it when you want to get them ready for taxes/exporting? This is early days (the software has one been out for two days in North America) and as with most things to do with going paperless, I suspect we will all find the way that works best for us. ScanSnap Receipt isn’t the most beautiful application in the world (Mac design people may not approve), but to me it hits the key areas: it can take a receipt, extract the information out if it, let you clean it up, and then export the data. I’d like to hear from you, especially if you have been waiting for years for a ScanSnap receipt tool. Does ScanSnap Receipt meet your needs? What features would you like to see? How do you add up all the total of all the receipts? Hi all. It took me a while to find support for Scansnap Receipt (V1.5L41) because I noticed that many receipts are no longer linked to an image. I can’t even export those receipts (error message). Nor can I do backups anymore (error msg: The destination folder either does not exist…). I run Scansnap receipt as Admin and I tried backing up to the desktop, to My Documents, to the cloud… In vain. I did the ScanSnap Receipt backup (.ssrbk format) and I’m wondering whether this backup will include the images of the receipts. Some of the comments above mention that the images can be found in the ScanSnap Receipt folder (C:\Users\\AppData\Local\PFU\ScanSnap Receipt\ssrimg\body) but I do not have this folder. Where could the images be? Hi, I can’t seem to update the comment field. Is there some trick to this. I tried many ways, soon as I hit SAVE or ENTER key after editing comment field, entire record disappears. I go back and restore. Would be nice to be able edit the comment field. feel stupid, it is still there, just check/uncheck issue. My bad…. its all good now. I had to wipe my computer and lost all my receipts. I did find them on a backup server and downloaded them back onto my computer’s hard drive. The problem now is that I have no idea how to import them back into ScanSnap Receipt. Any idea how to do this? I’ve been using ScanSnap iX500 for almost a year, and I’m here in Canada. I received the ScanSnap Receipt file when I bought mine in 2017… so most of you shouldn’t have a problem! Now – I’d like to know the difference between: Category A and Category B.
I have two businesses, and have different categories (main) that can drill down into sub categories. The problem is, I need to be able to drill down further. However that could only be done if Category A and Category B can be separated. When I got to click in the settings to change to Category B it says “All categories will be replaced at once. Categories with reference count of 0 will be Deleted. Do you want to Continue? “. I don’t want to continue and delete everything… so please help out wit this!! Another terrific review of the workings of the default software. This is important when trying to decide between going with the Evernote edition scanner (iX500) and using Evernote or figuring out another way. This seems like another excellent solution. once the cvs is exported to excel how do i add formulas to excel to calculate totals on certain columns. 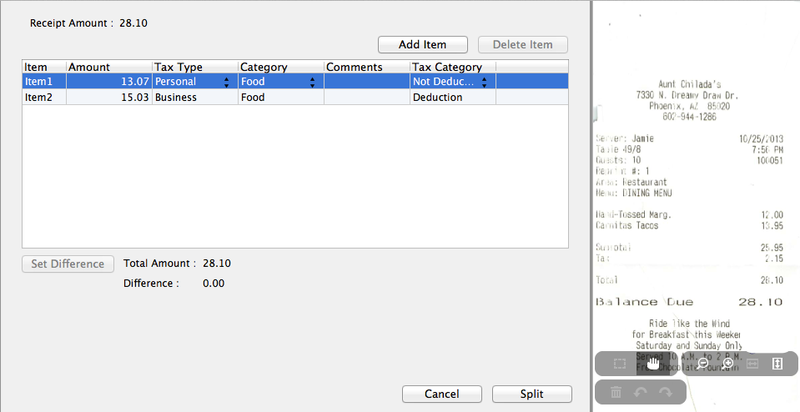 Looks like the import mac or windows prevents formulas from working in the workbook. Thank you for your help. I just imported a ton of receipts, cleaned them up in ScanSnap Receipt and exported them as individual PDFs to a file folder and it seemed they lost thier OCR. So whats the point? I’m having difficulty finding tutorials, videos, blogs on this topic. Well, crap! It appears that my YEARS of receipts vaporized when I had to reset my computer. I assumed the files would be saved and didn’t consider the receipts to be in any danger. WRONG! It’s stupid that they aren’t just saved to a file somewhere on the computer. I mean, they’re PDFs, aren’t they? This is very frustrating. Were you ever able to recover your years of data? The same just happened to me. I saved the files in documents and now that I can’t find them it appears that Scansnap never saves to that folder. STUPID!! I found and downloaded the file folder on a backup server, but I have no idea how to import them back into ScanSnap Receipt. Another thing that is painful – very hard to auto-fill certain fields. For example, many, many receipts are for repeat purchases. If the vendor is recognized, we should have the option to have the category, tax status, etc. auto-filled with the most common values for that vendor. But even better would be the ability to export the data to CSV file (which is now possible), modify the data in a spreadsheet or database program, and import it back (not possible) into ScanSnap Receipt. Then you use any fancy logic you want to auto-fill any blank fields. You can export to a CSV file, but you can’t currently import it back at this time. It would open up amazing possibilities if they implemented that, including migrating data from another receipt application, etc. Another feature for the wish-list would be to make custom fields for your receipt. I like to notate the location of the receipt expense, where the expense was incurred, things like that. You can use the comment field, but it can become overloaded with different types of information. One more for the wish-list — put all the fields in the list of the “right-click-select-OCR-fill” menu. I’d like to highlight part of the receipt and OCR the info into the comment field, but that option isn’t available. The files have no extension, but they are “jpg/jpeg” files, so if you copy one and add the “.jpg” extension, you should be able to see it in any image application. So backing up those files might be another way to protect yourself or helpful for recovery. Boris stated that when you use the “Tool | Backup” feature, it saves both the data and the images, and he felt he could demonstrate that on his system. I’ll check, but looking at the size of my backup file and the sizes of the database and image files, I believe it is true. The database backup is actually smaller than the original files, but good compression could do that and it is still much bigger than the database file alone, so I conclude it includes the images. Why did this program can not read automaticly Brutto sum! It does only find Netto sum! I have been using the SnapScan ix500 for about 2 months. I too switched from Neat when the scanner stopped working correctly and they offered no support. I find the SnapScan ix500 a wonderful scanner. However, the SnapScan Receipt software leaves something to be desired. The biggest fault is no autofill when editing a receipt. Also, it would be nice if one could select a default for fields such as (Business, Personal, Unknown) and (Deduction, Non Deduction, Unknown). All in all, if I had to do it again, I would still get the ix500. I agree completely Al, when most of the receipts we scan are for business and deductible, it would really be nice if you could change the default to those , or at least be able to select all the receipts you’ve scanned at once and change to business, deductible in a couple clicks. #1 does receipt always fire up by itself if you scan a few receipts either with / without scan manager? if not how do you ensure it does? 2 dont ask me how, but ive got a business card inside my listing of scanned receipts, do i just delete it an re-scan it, or should it be transferred out of there somehow?? Hi all. Thanks for the article Brooks. Thanks everyone for the comments as well. Like many I am transitioning from Neat. We are OS X so the scanner simply stopped working one day when Neat stopped supporting the drivers. We were required to pay an additional $40 for the Neat Mac software on top of the Neat package, so we were always especially disappointed and frustrated with the instability and problems Neat for Mac had. The lost our trust when they decided to leave us high and dry so we are not interested in any solutions they have to offer. I’ve been using the Scansnap ix500 for a few days now. What I’m really looking for is advice on whether there is something better out there for a scanner or software for our needs. I’m already very concerned with Fujitsu’s attitude towards Mac users and am ready to return this to jump ship to something else. If you have any thoughts please share. The scanner itself has been wonderful so far. It is fast and smooth. Setup was fast and easy. Hasn’t even hiccuped yet. I like how quiet it is, the design, and the small foot print. I was initially concerned that it didn’t have different sized feeders like the Neat scanner for business cards and such, but found by following the directions in the manual with placement on the rollers, these aren’t necessary. I think the Scansnap is far superior to the Neat scanner. The problems I already see are with the software. I mainly need the OCR for documents and receipts. I found that we don’t really need ScanSnap receipt as it is better for us to scan receipts to a central folder, or to the folder associated with a particular project. It is too cumbersome to manually select vendors and categories in a drop down menu with no autofill. Receipts also doesn’t get a lot of the amounts correct so I end up typing these in manually by hand anyway. As others have pointed out, the inability to categorize or make changes to batches of receipts is unbelievable and a deal breaker for us. For our needs, because of the limitations of the software, it is better to have all of the receipts organized in folders and then to create reports manually when the time comes. If there is a better solution for software to manage receipts I’d love to hear any suggestions. What we do need is good OCR and workflow on documents. I’ve already determined that it is much better for us to “scan to folder” than to use the organizer. This is where a number of issues come up for Mac users. I’ve been trained over many years to scan documents face up. I’m dumbfounded at the Scansnap does not allow Mac users to do this and requires face down scanning. This really slows down our workflow because we need to be able to read and then type titles and headings from the pages we load to use in naming the .pdf files created. We now have to pick the documents up after scanning and turn them over and set them down every time we create a file. This is very cumbersome. To add insult to injury, PC users are able to easily change this setting. Despite other Mac users already asking for this change, it is not available. Easy fix and not understandable why Fujitsu would neglect Mac users this way. It isn’t a convenience issue. It is a productivity issue. The software also doesn’t allow any editing of the scanned image before saving. The Scansnap creates many more blank pages than Neat did by detecting slight creases of bleed through from the other side. This wouldn’t be an issue except that removing these pages before saving is impossible. The file must be saved, located, opened in another application like Preview, and only then can the page be deleted. Of course, this applies to all edits such as orientation errors and changing the order of the pages. I would like to make these changes BEFORE saving the file. If there is a workaround I am missing please share. Is there a better solution for us? Any suggestions would be much appreciated. Thanks in advance. Hi. I had been using Neat software for several years until they quit supporting it without charging me for it. The one thing I loved about the Neat software was that it generated reports. I just bought a Scansnap s1300i and downloaded ScanSnap Receipts and can’t find any way to generate reports. Am I missing it or does ScanSnap Receipts not have that function? Thank you. If you right-click on Receipt DB.ssrdb and choose Show Package Contents you can see the individual data files. In the subdirectory ‘ssrdat’ there is a file named ‘receipt.ssrd’. I opened this file with TextEdit and saw the file began with ‘SQLite format 3’, so I’m guessing the program uses SQLite and that file is the database file. In the subdirectories ‘ssrimg/body’ there are a collection of files without extensions. When I highlight one I see an image of a receipt in Finder (using the multi-column view). Right-click and select Get Info and it displays that the file’s Kind is a TIFF image. It seems like a nice, clean, straight forward design to me. We just purchased the ScanSnap. We also purchased the Rack2-Filer software which is a really neat “filing cabinet” where you can save all of your receipts and store them into neat folders. However, we also want to use the ScanSnap Receipt software. I just don’t want to do double the work and I don’t like the visuals of ScanSnap. How are other people using the software? And are you saving to a cloud? 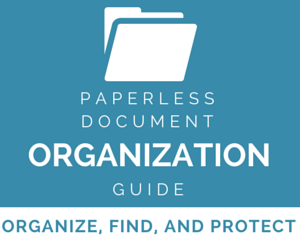 Are you creating several folders for receipts by month? Thanks for your help! Did anyone have a problem with the latest updates for ScanSnap ix500? My ScanSnapReceipts will not open. I had an issue where the application wouldn’t open and was returning the error “Failed to start up ScanSnap Receipt”. This error in my case was caused by a corrupted config file. To fixed the issue go to the C:\Users\YourUserName\AppData\Local\PFU\ScanSnap Receipt\ssrconf folder and delete the config file called conf.ssrc in the ssrconf folder. The program should run again. I have just moved from Neat to Scansnap Receipt and compared to Neat I think it’s great. I use it for filing houshold receipts, bills etc. While there are some basic functions missing that seem to just come with any other window product, Scansnap seems to have left them behind. One in particular is scanning a multi-page invoice as a single pdf. You just can’t do it in Receipt. I have been looking at getting a scansnap scanner and receipt software, but have a question. Does the software support more than one tax field, e.g.. GST and PST. Has anyone figured this out yet? I can’t believe this isn’t included, so many places have seperate taxes for state/province and federal. The support from them has been useless, all I got was download links, the software I download was the exact same version, same problem. No actual personal response. Thank god I bought this from Costco and I can return it if this doesn’t work. Is it possible to add more fields, f.e. invoice numbers in the ScanSnap Receipt? No, there is no option to add field. There is a comment field where you can add any information you want. It is not displayed on the listing view, but is visible when you edit the item and it is exported as part of the csv. Is the ScanSnap tool required to use the ScanSnapReceipt software? is there any software that works on the PC desktop with a regular all-in-one scanner setup? Yes, you need Fijutsu scanner and software. For non-Fijutsu scanner, you can try Mariner Paperless. But if you have used ScanSnap scanner, you would not consider anything else. There are so many things that ScanSnap does so effortlessly that you take it for granted, until you try to do the same thing with other scanners. I tried using a Brother All-in-one and it was a pain. First the auto feeder was not designed to take small/narrow pieces of receipts. I could not get it to scan using the auto feeder, so you I have to use the flat bed to scan one by one. By comparison, I can load a pile of receipts in all different sizes and lengths, and ScanSnap would finish it is minutes. ScanSnap also automatically resize all the scanned image to match the original receipts – and properly rotated, and deskewed. So all scanned images look perfectly aligned and correctly sized. I could not get my Brother All-in-one to do the same. Brother has some dedicated scanners which may work better, but I have not tried those. But their ScanSnap Receipt competitor – BR-Receipt is not available outside US! Have to join the dog pile. It’s disgraceful that a company holds its customers hostage in such a way. There is literally no reason this software shouldn’t >at least< be a paid option for users of earlier machines. While I love my S1500 and think of Fujitsu as being a company that developes uniquely Japanese products in terms of design language, it seems that they've also joined the ranks of Netgear. They will sell you an expensive piece of hardware, support it with a modicum of software updates and then, when something meaningful comes along, slam the price tag down for an unnecessary hardware purchase. Contrast that with a company like Synology which keeps its users up-to-date for years after their purchase of hardware, adding new features and functionality all along the way… So I don't know. Maybe product abandonment is also a Japanese way of doing business. Don't know much about their culture. But I know I won't be buying another scanner. And I'll probably add Fujitsu, in general, to the list of companies that I no longer support. <–Funny how it goes both ways. Count me as another disappointed S1500 user. Abandoning support for older hardware when there is no technical reason for it is a cheap move and you are not in the cheap scanner market. Lack of upgrade support will be remembered when it’s time to replace my scanner. I’m an S1500 user who also wonders why I’m not getting the ScanSnap Receipt upgrade. Love the scanner but beginning to wonder about Fujitsu and their commitment to their product and customer base. What I’d really like to do is import from a directory of files. I have a ton of receipts stored in a nicely organized tree of directories, but to import them to ScanSnap Receipt, I have to drill into each sub-sub-sub-directory, select all the files, import them, then repeat endlessly. This may seems super simple, but why couldn’t you just search the top level folder for all .pdfs (include subfolders of course)? The would all be in the window and you could just drag and drop them into the program. I’m a new scansnap ix500 user with a lot of receipts to process. Each google search I have tried (many) brings up your blog – congratulations for having such a high google profile. The thing is this: I can’t believe that Scansnap would not have settings that allow users to process the data quickly once imported. It seems unbelievable to me that I will have to spend literally hours deselecting ‘personal’ which is the default setting & replacing each field with ‘business’ and deselecting ‘non deductable’ and replacing ‘deductable’ for each single entry. It seems obvious that the defaults should be exactly reversed. It seems obvious that the vast majority of times a user is going to be ‘saving’ receipts for the purposes of declaring tax deductions for the IRS? There are so many clicks I am now required to make to get this to work. No autofill in any of the fields? A ‘Vendor’ drop down menu that is cumbersome. And no way to correctly tag a set of receipts in bulk? I have found a few people refer to how cumbersome this is. It’s going to take me a day to correct these receipts which is not really faster than logging the numbers into a spreadsheet. I would welcome your comments here since you seem to have the floor with users like me and with Fujitsu Scansnap company. 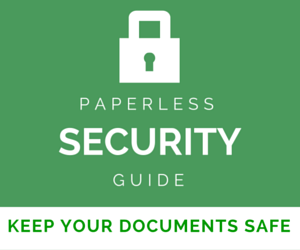 Thanks for your good work in posting information about the steps to go paperless! Those are great suggestions. I agree with all of them! Hopefully Fujitsu will make things more efficient in the future. great write up! Also I love your site, there’s a lot to learn here. I would really love the Receipt software, if I didn’t have a similar problem to Megan’s. I am scanning lot’s of receipts, so it seems kind of ridiculous to me, that there isn’t A fast way to categorise receipts at once. I mean the functionality is already built in, you can Already do what I just said with the Checked/Unchecked property, so I see no reason why you couldn’t batch-edit the other fields as well. Or is there some way to do this which I haven’t found out yet? What I resorted to was Scanning all receipts of a particular category, then selecting them all and export to a CSV, and then edited the CSV data directly. And then start over doing the same with the next category/subcategory..
Then in the end I copy & pasted the edited data into one central Excel file. But to be honest I am kind of disappointed , As it would be so much easier to use this software if it just had a proper right click menu to batch edit any of the fields. I agree with your comment. I’m particularly floored that there is no Mass update option to say, assign the category and sub category to a group of records. This should be a no brainer for them to include. Have you contacted them about it yet? Exactly, this is the most ridiculous thing in the world. I mean, I am not going to notate and organize personal, non-deductible receipts… get out of here. Is there a way to switch it up after exporting to quick books or to Expensify or something? My interest is the Scan Snap Receipt software. I eventually learned that this software is not supported for the ScanSnap S1500. My major gripe is why not? After spending $600 CAD, I am not about to go out and buy a new scanner, yet the receipt software is something that I’ve been hoping for from Fujitsu. I’m sure Fujitsu personnel SCAN this site so my complaint is aimed at them. Your decision to not support S1500 customers with Scan Snap Receipt jeopardizes future sales of S1500 owners seeking hardware replacements because they won’t trust you to support the life cycle of the hardware. Please re-consider, and configure Scan Snap Receipt for S1500 customers. 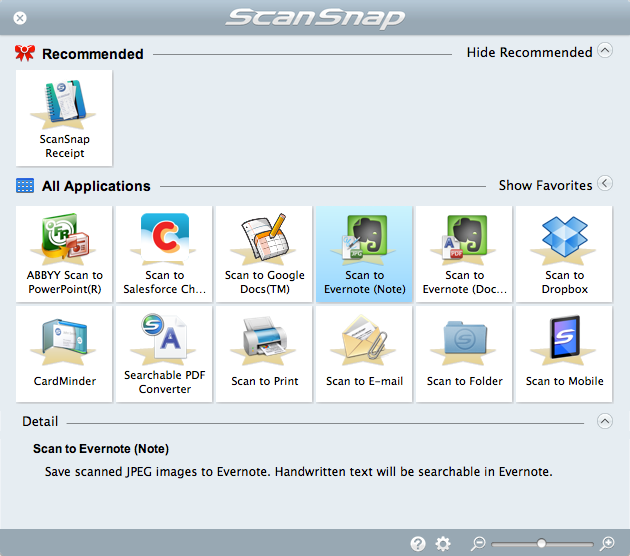 If someone uses Evernote exclusively, why would they use Scansnap organizer? What does that program do? If you use Evernote exclusively, there is no need to use ScanSnap Organizer. It’s a document management system. Same here, I store all of my docs in Evernote for accessibility and other features, If the Receipt software could use Evernote as the backend data storage, I’d consider using it. Any way to add custom Tax Types? I have 2 companies and I want an easy way to distinguish the receipts for company A, company B, and personal. If I could add a custom type I could add the company name and I would be set. Motivated by not wanting to fill up my C drive, I looked for the ScanSnap Receipt folder as guided by Brooks, (so I could store the data & receipt elsewhere, just not in proprietary format). According to Fujitsu though, they do not want you to find that folder “because it’s too easy for users to mess up things up.” Thus Fujitsu has ‘hidden’ that folder. However, I can export my data in a CSV file and as individual PDF’s to another location (for my purposes, off my C drive). In reading the Help file, once those files are exported, I can come back to ScanSnap Receipt and delete the receipt(s), which moves the selected items to the trash can, and then empty the trash can (the receipts are not deleted permanently until the trash can has been emptied). This way I have the data from the CSV file, plus a PDF (if I need to go back and produce a hard copy for whatever reason), and my C drive isn’t clogged. With my back-up of my other location, I’m happy, and ScanSnap Receipt is kept running nice and lean. Hope that might be helpful to someone, but if anyone thinks of a problem I could be heading towards, please speak up. I too would love for them to enable the software to change storage location . I have a SSD C drive and don’t keep anything on there other than the OS, and need to be able to move these files. correction to above examples, reverse the Target and Link paths. I’ll get it right yet…. replace “MyName” with your user name. this will create a “symbolic link” from the Appdata\Local folder to D:\ScanSnap Receipt” folder. note you can link to other folders or drives just change the path to where you moved the ScanSnap Receipt folder. And this is why people don’t do symbolic links. Old post, but you can use file juggler to move them automatically. Thanks for the tutorial; this was an unexpected surprise. 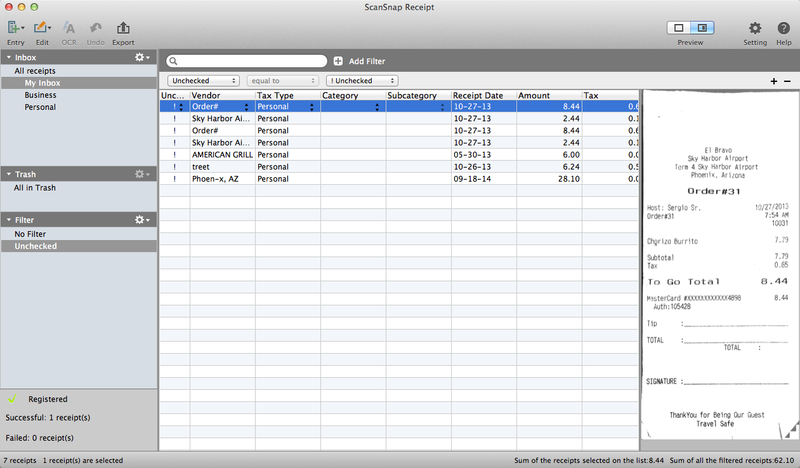 I’ve had my ScanSnap xi500 for a while and was hoping I could use it to export receipts into my Quickbook file. Here’s one issue though, and I can’t figure out why it’s happening. My receipts are being imported to my Quickbooks 2015 company file as bills, not as expenses… any ideas why? Bought an iX100 today and downloaded ScanSnap Receipt in Norway via the Download Request Form. I recently purchased a Fujitsu IX500 and installed the ScanSnap Receipts program. I have also been using a Neat Scanner and have years of scanned receipts in their NeatReceipts program. Is there a way to export that data and import it into ScanSnap Receipts? I know you can export from NeatReceipts but the exported file is in a proprietary Neat format. I recently relocated and had the Neat Scanner stolen. I’m hoping not to have to buy another one and use it side-by-side with the Fujitsu since it is such a superior scanner. Hmm, you could export the PDFs from Neat and import the PDFs into ScanSnap Receipt. That’d work. I don’t know of a way you can import, say, a CSV with all your categories etc. already set That’d be nice. Actually I just dumped my Neat Desk & am doing what you are asking about right now. I’ve had Neat Desk since 2011 & have a ton of receipts, but moving them over is not as bad as I thought. I have my receipts broken down in folders by years & in business & personal. When I open 2015 business I can right click on a receipt, then choose export. From there a dialog box opens where I can choose to export as PDF, then choose to export the entire folder, then export as separate receipts, then export to a folder on ,y desktop called 2015 business receipts, then click export. After a few minutes I have an individual PDF for ever 2015 business receipt, from there you just highlight them all & drag them to my new 2015 business receipt folder I made in snapscan receipts & they appear. I was really sweating having to do one receipt at a time, I was thrilled to see the export folder option in Neat. Many thanks for your books on scansnap, paperless and now receipts. It’s very much appreciated. Just downloaded the UK version and will be road testing it this next fortnight. Will post back if I have any helpful comments. I thought I would post this as a token of my gratitude; I would not have learned even learned about the existence of ScanSnap Receipt if not for this website, and the idea that Canadians would be excluded from software that is equally sought after left me [cough… you know!]. Thank you for buying our ScanSnap iX500 scanner. Canadian customers can download the ScanSnap Receipt software by filling in the request form at the URL shown below. Shortly after you submit your completed form you will receive an e-mail response with the actual download URL, a user name, and temporary license. I hope that you enjoy your ScanSnap Receipt software! So to my fellow Canadians… Enjoy!!!! Wow! And the download worked for you? Thanks for the tip! If your entry correctly matches an eligible ScanSnap product, you will receive an email [mine was nearly instant] with a link to download the product, click the link and after you enter the user name and password from the email.. voila – both Mac and Windows versions are available to download and they install and run perfectly. They also include all updates previously released. Thank you so much again for this article! This is awesome. Thanks so much for sharing Nekipedia. As a legal professional, I also feel I should mention to all your readers [those that decide to use the above link], make sure that you read the email you receive in its entirety, as it contains very explicit legal warnings that prohibit the dissemination of any of its content, and by any means. Put simply, Fujitsu expresses their intention to maintain legal title and control of their intellectual property, and those that breach this by forwarding, posting or sharing the confidential information Fujitsu has disclosed, do so despite the conditions and notice contained within! Have a great weekend and HAPPY SCANSNAPPING!!! <— A little cheese for you Fujitsu style… haha… I’m gonna copyright that… so don’t start ordering t-shirts! ScanSnap Receipts and Paperless by Mariner Software sure look very similar. It seems that nobody is impressed with either one. Is there a better receipt program that is available on the Mac? Hi, im using a canon imageformula scanner – is there something similar for the canons? I’m looking at buying a 1300i, was this receipt software ever released for that model? Thank you for contacting Fujitsu Technical Support. Please fill out our download request form to download all qualified software for the S1300i. An email will be sent to you afterwards with the Receipt software inside. I did write, back in the early days, a macro in Excel to take Neat Receipts output and generate a QIF for Quicken. (before Neat added QIF support) Once I get this up and running I’ll adapt it for ScanSnap Receipt and send it to you for anyone that might want to use it that way. It was pretty much a 1-click deal, it just involves the middle step of opening the Excel file to translate the csv into QIF. Will keep you posted. Thanks for the help with customer supp’t! AS WOULD I!! If you consider it open source, I would REALLY LOVE to have a look and help automate some processes..
Ditto Brian. A macro like that would fix the one beautiful thing that Neat actually did OK. Count me in please. Has anyone been able to use the scansnap receipts with Quicken? I see that in 2015 someone was working on it. I have been using the receipt software since it came out last year – without any major issues. Yesterday, I received the error “Failed to start up Scansnap Receipt.” I found help in the Knowledge Base that suggested it may be a corrupt database or installation so recommended the typical uninstall/reinstall. This did not help at all. The scanner works, all the other ScanSnap applications work, just no ScanSnap Receipt. My concern is that I will lose seven months of receipts – that I have of course shredded. That doesn’t sound good! Assuming you have a backup of your drive, you should be able to restore the database itself. Even better if you have a backup like at the end of the post. Either way, Fujitsu support might be able to help. Hit up their chat support at http://www.fujitsu.com/us/services/computing/peripherals/scanners/contact/index.html. i downloaded and installed on my Windows 7 pro with no issue. What I would like to see is what another product does assign an e-mail address so you can e-mail directly into recepts. Maybe the next version will offer that feature. Thanks for you great review. I have the IX500 and I would like to use ScanSnap Receipt. The main problem for me is the database is put onto my C dive which is a 180GB SSD. There is no option to move the database to another drive. Unfortunately, Receipt would fill my C drive in no time. You know, this software is a beautiful mess. First, had to contact tech support to find the right link to download it / software update was outdated but could not update. Second: OK i have 1000s of receipts that i use for my bookkeeping in Quicken. I slurp hundreds of them in at a time, already OCRed with the nice Abbyy engine at scan, and the beautiful mess happens. Vendors are messed, usually in a regular enough way. There is no way i can find to select a subset batch of receipts and re-assign the Vendor to the entire selection. Dealing with thousands of receipts and just getting the vendor right should not be a one by one thing. The math is all over the place. These are 300dpi b/w scans from an imperfect world. 90% of the time searching dates or stores in OS X finder works fine. But sometimes, broken printers, spills on receipts, all sorts of stuff happens. I cannot tell where the bad OCR on numbers is happening. I tend to scan receipts with OCR to copy/paste from the PDFs. The app is a good start but needs refinement; either the Japanese developer needs more real-world receipts to match the code against, the OCR implementation isn’t as good as just OCRing the receipts at scan (all my Whole Foods come in as treet in vendor), some sort of accuracy stats need generation and looped back to devs, something. Since you asked, here are some of the biggest challenges for me. That said, the software is wonderful, and I am using it, so there is much more good than bad! 1. The biggest challenge is what to do with receipts suffering from the problem of “disappearing ink.” If there were a feature that would automatically increase the contrast of anything looking like text as you bring a receipt into this software, that would be super helpful. Or even a tool within the software – like a magic illuminating wand or something – to help you clarify an area of the receipt. I’m often reticent to throw away a receipt that’s like that, because the print doesn’t show up on the scanned version, but I can see it when I hold the physical receipt up to the light. For one very important receipt I had, I ended up putting it into photoshop. But that’s really time-consuming for one receipt. 3. Another thing is that the dropdown menus are too short by default, so you always have to scroll. You ALWAYS have to scroll because the dropdown combo boxes don’t have autocomplete, so if you start typing, you run the risk of creating an additional category you didn’t intend to create, which you can’t get rid of (see item 2 above). I use ix500 and I love feature of receipts. However when I try to export receipts into pdf to have a backup of scanned documents, naming is not really working. It just throws all dates together with no separation. Is it possible to modify how the scanner names file during export? Great info but since it isn’t available in Canada, it’s not relevant for me. I’ve got two Fujitsu ScanSnap scanners and I bought them for their software. I’m not happy about not being able to use the Receipt Software that is one of the main reasons that I bought this equipment to manage. I don’t know why Canada is not included in the release but I hope they change this soon! Thanks! Re: Storage and Backup. The data is not stored in a proprietary database. It is stored in a folder that is hidden by the Mac OS. But you can navigate there using a Terminal window or see it by right-clicking on the file “Receipt DB.ssrdb”. By selecting “Show Package Contents” you’ll see the two folders “ssrdat” that contains the database and “smimg” that contains the scans. Scans are image files viewable in Apple’s Preview app and can easily be converted to PDFs. As for the database, the header states SQLite format 3 and it appears readable with free software available in Apple’s App store. By default, Apple’s TimeMachine will back up the files. In short, no need to be nervous about losing one’s data! Where is the database stored on a PC? Sorry to say that I don’t know about Windows. could you confirm that Apple’s TimeMachine, will backup the database file? Also where is the database file stored; i.e. is it hidden within My Documents? Thanks. Anyone used scansnap receipts to import into quickbooks enterprise. E.g bills, receipts etc. need to make a purchasing decision soon. I’ve recently purchased the ix500 from a credible source. I’m extremely disappointed as I believed that I was purchasing this product with the ScanSnap Receipts program. I found an update on the Fujitsu site and downloaded it; though unfortunately it will not run on my pc as the original Receipts is not loaded. If you bought your ScanSnap in the United States, you should be able to get ScanSnap Receipt by going to Help > Online Update in ScanSnap Manager. You might have to do it 4 or 5 times (crazy I know) before it downloads everything. If that doesn’t work, Fujitsu support should be able to help you. Their chat support is usually pretty helpful. You can reach their support here: http://www.fujitsu.com/us/services/computing/peripherals/scanners/contact/index.html. Love it this is exactly what I was looking for. Let me qualify that, it has some quirks and poorly documented. It occasionally gives you errors. I am sure most of this will be worked out in future releases. What I Like is the flexibility. I have used neat receipts and paperless. Neat receipts is very good at receipts. It is also very slow and cumbersome to use. I was able to take my rental property receipt and group them by property with the folders. I then ran filters to zero in on the year. Was able to export a CSV file of results. But the best part was when I exported all the receipts for the property to pdf and sent it to file center for future filing an backup based on tax year. In file center I only see one pdf and it has all the individual receipt for a given year. I hope this inspires others to experiment with the flexibility of this product. Is there a way to change the category default in Receipt? It always comes up ‘Personal’ and I have been manually changing them to ‘Business’. Surely there is a way to change this? I’ve tried everything to get ScanSnap receipt to my Mac for a newly purchased ix500. Nothing works – tried all of the tricks listed above and nothing. Did you try reaching out to ScanSnap support at http://www.fujitsu.com/us/services/computing/peripherals/scanners/contact/index.html ? The ScanSnap receipt software is not a well documented product. There is very little information on it. I can’t even find information on how to close out the file that I used for 2014 and starting a new file for 2015. I am very nervous about continuing to use it for my important receipts. Unfortunate, as it has some very nice features like auto completion. For now I will stick with the competitor’s database software. 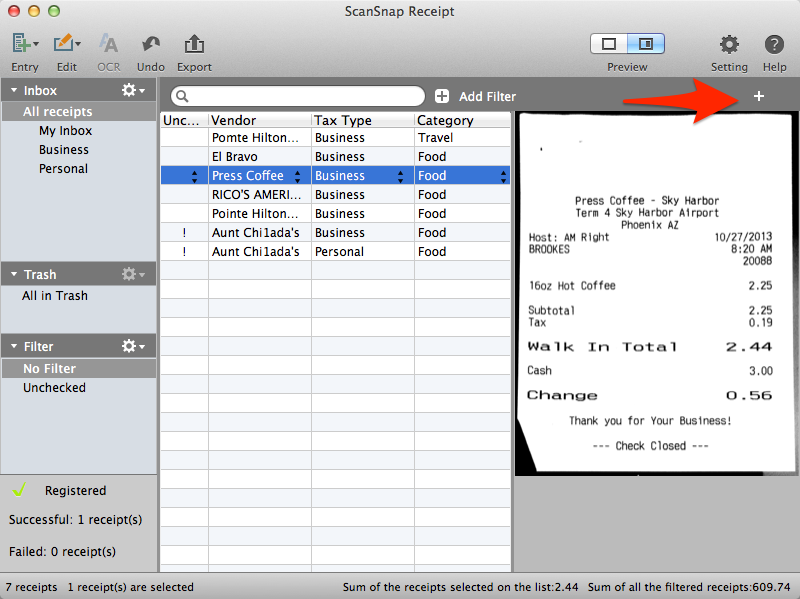 ScanSnap Receipt on My Mac FINALLY! I just bought an iX500 and set it up on my Mac (running Yosemite). I tried everything to find the elusive ScanSnap Receipt for Mac to no avail. I had all but given up. But then I read a PC related comment (way above) by the person who finally got Receipt on his PC after running the online updater several times. As a last ditch attempt, I ran the AutoOnlineUpdater (from my Launchpad) but alas it only found an update to ScanSnap manager. After I installed that, I decided to try one last ditch last ditch effort and ran the AOUSetting tool (in Launchpad). I clicked “Check for Updates” and a new dialog popped up directing me to connect my scanner to USB and turn it on and click “Identify Device” so that it could look for the correct updates. As soon as I complied, voila! ScanSnap Receipt showed up as an update. Hurray! 1) When you are splitting a receipt (e.g. when part is deductible, part is not), typing in the amount for the split portion gives an error message (“the total is different from the original amt” or something like that) – the app should KNOW what you’re trying to do and adjust the remainder accordingly. Quicken does this – why don’t these guys? Do I really have to subtract in my head or drag out the calculator? Sheesh. 2) When you enter a vendor that the app is familiar with, it should autofill the category and etc. fields for you. It’s a huge pain to use the pull-down menus over and over again. Every time I enter “Rite Aid” it should know I want to choose categories that point the data toward recording amounts paid for Rxs, for example. Another way to do it would be to autofill as you type – typing “H” would give “Health,” and “P” would give “Prescriptions,” for example. But autofilling based on the vendor would be the smart solution. If anyone has found a way to solve these problems I’d appreciate knowing. These issues make the app’s user interface a little flat-footed and less elegant than it should be. Ok everyone, major problem here. SS Receipt updated to the latest version (V1.0L30) via SS Online update and when I reopened the program after the update, all of my unprocessed receipts that were in my inbox have lost their images. Completed (Checked) receipts that I have processed prior to the update appear to be ok, but all the receipts I scanned into SS Receipt but didn’t edit (Unchecked) all have “No Image” on the receipt entry and unedited OCR results in the list. Major problem. Fortunately, I’ve been backing up the DB everytime I use it, so I’m able to restore and the images reappeared for the unprocessed receipts, except now there’s a duplicate of each. I’ve submitted a support request online. Thank you! I saw the update and was excited. I have been wondering how to do my receipts. love our ix500 even without the twain support. but one thing i noticed is the lack of multi-user/device support. my wife and i are on different computers but need to have access to documents we scanned. our workflow uses google drive for storage. it works well for collaboration and accessibility but we’re stuck with receipts as pdf files. i’m looking for a way for a software to take my pdf receipts and turn them into a database. this software looks like it’ll do it but i’ll lose the “cloud” feature. has anyone gotten this to work with multiple users/devices? can you change the location of the database file and use google drive instead? is there anything that’ll OCR my pdf receipts and put them in a database but have it online with multiple user support? If you use dropbox, you can manually add a sync folder from anyplace on your PC to sync. As long as both of you aren’t in the program at the same time, I think it should be okay, but I’ve never tried this before. You could also use one of the mobile expense tracking apps, such as Expensify to achieve the same thing. Just opened the box on my new Scan Snap and scanning receipts within minutes…… you said receipt images and data is stored in a proprietary database? how do i find this database in windows 8? I haven’t installed it on my brand new Windows 8 computer yet but on my other Windows computer it is under your home folder at AppData\Local\PFU\ScanSnap Receipt. Check there. Has anyone successfully printed a full-page receipt using ScanSnap Receipt? I have tried to print a couple of 8.5 X 11 receipts, but they were not centered on the printed copy, and the right side of the receipts were cut off and did not print. To get a good printed copy, I had to export the receipts as single pdf files to a folder of my choice, and then print the pdf files. No problem printing skinny receipts. I’ve noticed a few annoyances with ScanSnap Receipt that really need to be addressed if it’s going to be a mainstream application. 1) You can’t have multiple files. I want to have one file for personal use and one for business but there is no option to create/open/save files anywhere. 2) When you scan a receipt, the OCR attempts to determine the Vendor, which is fine except it stores that vendor in the database, even if it’s unreadable hieroglyphics. What’s worse, there is no way to go in and delete entries from the list of vendors. This application has a lot of potential, but until the above items, and likely many more, are addressed it borders on unusable. Great suggestions Ron (not sure about the “unusable” part though – I’d qualify and say unusable for you 🙂 ). It’d be great if they implemented these though. Great points Ron. I agree that ScanSnap Receipt has a lot of potential, but also believe it might not be ready for prime time based on the numerous issues you and others are pointing out. It doesn’t look like anyone from Fujitsu has responded to any of these comments about ScanSnap Receipt, but hopefully they are at least reading Brooks helpful articles about ScanSnap and are working on fixes! Great article! I just found out about this ScanSnap Receipt software.. don’t know how/why I didn’t get the info when it came out in September. Anyway, I installed the software and scanned one receipt. I use Quicken Premier and all my credit card transactions are downloaded there. I am wondering what benefit do I get in using ScanSnap Receipt software while I have all the data for report or tax purposes in Quicken. Am I missing anything here? BTW, I do scan certain receipts as PDF and scan to a network mapped drive/folder. 2. If I need to do anything with the data, now I need to do export and import steps..
3. And, if I need a PDF of the receipt, I need to export that as well because I noticed that even though I had specified the network drive/folder in the ScanSnap profile, the PDF file didn’t get saved there and instead it got “saved” within ScanSnap Receipt database.. So, I am really not seeing much here.. what am I missing? Thanks for the great review. I have a S1100i right now – any idea if Receipts will be made available for prior ScanSnap owners? Could I just download the software (manager) for the ix1100 instead to get it? I’m based in singapore, will we ever see scansnap receipt? Just installed this to go with ix500 which I use for everything and love it. any way to get a report on specific category – food, Dining, Etc.? – Ability to relocate the location of the database file and image storage. 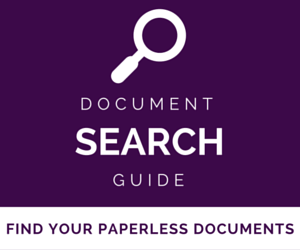 – Export should produce searchable PDF files. At least the images are not huge as they were with Neat. Agreed. Exported PDF files should include searchable metadata. Inclusion of the hand-entered/verified metadata would be especially helpful when sending off copies of receipts to third parties such as accountants, etc. Additionally, I may wish to have searchable receipt imagery available to me without needing to go back to the machine that has ScanSnap Receipt installed. I hope this functionality wasn’t consciously omitted due to some focus on lock-in, ie trying to keep people tied to ScanSnap receipt software for all reasons. – Ability to edit/clean up Vendor list. Many of the wrong guesses of the OCR are ending up in the vendor list, making it cluttered and dirty. – Better keyboard commands for editing entries, both in list and ‘edit’ view. Going to edit view and limiting me to ‘Finish’ and ‘Cancel’ via the keyboard at initial display of that screen isn’t terribly helpful. For data fields making use of a selection list, be able to expand/display their selection list via keyboard command in edit and list views. – Fix the bug (or behaviour) when entering some years in two-digit form in the date field – which seems to be 2010 or 2011 I think, ie ’10’ or ’11’. Entering those years in two-digit format does not take, forcing entry of all four digits. There is also some wonky behaviour at times in the month and date fields. – Some additional user-defined categorisation fields might also be helpful. Simply quit out of ScanSnap Receipt and open up this with the SQLite editor of your choice (I used SQLiteStudio…). You can remove or correct any errant rows and once you commit the changes and re-launch they will be gone! One more thing… make the Inbox list resizable vertically please. Very helpful info…but it’s a pretty techie workaround, and this is a problem (not a “bug” as others may call it) that Fujitsu needs to acknowledge and fix asap. Just wanted to post a followup to this. I have found that as of recent versions (not sure exactly which; there have been a couple of updates — I’m currently running v1.0L20) that as long as you clean up your entries and be sure to Empty the Trash from within the SS Recipt app, the bogus entries are automatically cleaned up for you – no need to edit any Sqlite data! I’m on v1.0L30 and I don’t see the same thing regarding cleaning up the entries. 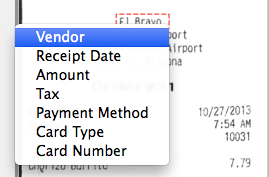 I still have a lot of garbage vendor names when I click the drop down arrow in the Edit box for a receipt. My trash is empty – how did you get it to clean up? Gordon, after you’ve emptied the trash folder located within the SS Receipt app, you then need to exit the app completely and restart it. The app will only retain the vendor entries that it finds in your existing receipt data, including the app’s trash folder. I did notice in my earlier runs the vendor list cleaned up somewhat, but not in later scanning sessions. Hadn’t emptied the trash folder after the early sessions! Problem solved. Thank you Luke – had literally just downloaded a SQLite client to do editing. Great timing! Your fix is still helping folks like me,–Thanks! I’m running SS Receipt V1.5L41. I like the scanner a lot but the software goes “clunk” on some basic stuff. As with earlier versions, it accumulates junk in the Vendor list and in the credit card number list. Seems to automatically post them whether you’ve finished editing or not. Neither of these fields have an in-app editor function to clean out the junk. The Vendor List just has a click-off/on box whether you want to see them in a pull-down list and the credit card list doesn’t even have that which makes for a lot of risk of secondary mistakes when the account number list is riddled with erroneous interpretation entries in small numbers from which to pick. Editing lookup tables is pretty basic database function in my world. Is it hubris coming out of the marketing department with their pitch that “the OCR gets it right every time” why these edit tools are not included in the software? Hi Jae, did you get any answer to your question as yet? As a fellow Canadian I am feeling a little bit violated by ScanSnap right now. I read that the software only works with U.S. dollars, which I assume explains the limitation. Hopefully, they’ll expand the currencies and make it more widely available. I’ve been using paperless ever since I got my ScanSnap, and ScanSnap receipts has a definite advantage. In the two days that I’ve been using it, I’ve noticed that it does a far far better job of capturing the information then does paperless. after the scan, I’ve been export to pay for this to create the report. What is missing in ScanSnap receipts is the report creating capability. I hope this will come in a future update. As an aside, I had difficulty finding the receipt software for download. I called Fujitsu and receive the best customer service I have ever gotten from a company. One of the managers called me back from home on a Saturday to walk me through the procedure. Great review and just in time. I got and installed the software but could not find a user manual. Any idea if there is a manual for this software and were I can get a copy? Brooks, this looks very, very similar to Mariner Siftware’s Paperless. It looks so similar that I wonder if it is a revamped version of Paperless? If it’s not, is there any obvious benefit between the two, aside from price? I’ve been using Paperless with my various ScanSnaps over the years, and find it very helpful and useful for my purposes. It really just indexes individual PDFs and assigns metadata to them, but hides them in an Apple package file so they’re not immediately apparently accessible. It’s easy enough to get to them with a right-click, and the fact that they’re PDF and not proprietary files means it’s possible to recover or extract them if necessary. I’d say if you’re already using Mariner Paperless there isn’t much of an advantage to switching to this. A partnership between Mariner and Fujitsu has resulted in the integration of Paperless with their best-selling ScanSnap scanners. Paperless is designed from the ground up to work effortlessly with the ScanSnap iX500, S1300i, and the ultra-mobile S1100. As a result, we decided to create the Paperless-ScanSnap Bundle. This bundle includes a copy of Paperless for Mac, and any one of these three, cross-platform, ScanSnap scanners. The best thing about our partnership with Fujitsu is that we can offer the Paperless-ScanSnap Bundle to anyone in the U.S., Canada, Australia, New Zealand or Europe. You’re INCORRECT. This is not Mariner Paperless; the cited partnership was for a free bundle of that product. It’s not as good IMO as DevonThink Pro. Receipts is a fujitsu-brewed piece of software. The Mariner Paperless software isn’t very good at all. I tried using it and it’s very slow and riddled with bugs. I’m waiting for the ScanSnap version. Beyond that, I use DevonThink which is excellent. Great review, Brooks. I don’t need a new scanner, but I do need software that handles receipts. If I had my druthers, I’d want something that would work with my existing ScanSnap S1500. But since that may not happen with ScanSnap Receipt, I may just have to buy an iX100 if I can’t find another option. 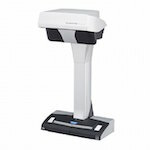 There’s an interesting review of the iX100 on Lawyerist.com (http://lawyerist.com/76508/scansnap-ix100-wireless-mobile-scanner-review/) where the reviewer sings its praises, but doesn’t recommend buying it. Instead, he recommends using an app like Scanner Pro and has included a video comparison in the review. I’ve looked at just using my Android smartphone with Neat Cloud for my receipts, but current reviews of the Neat app are very, very bad. So I’ve ruled out that approach for now. Are there any other Windows receipt processing programs around that are capable of working with an S1500? I am currently using a scansnap s1300i to scan my documents, receipts, etc by using the neat app. It has been working great with no complaints. I plan on doing three things at once is scansnap will allow it..send to neat, send to shoeboxed and send to a folder I can drop in dropbox.. I have an ix500 and have installed the online update and looked on the website and see nothing about scan snap receipts. I am in the USA. how does one access it? It should find and install the update. I’m my case I repeated 3 times, each time it found new updates. The third update included Receipts. One small note (probably doesn’t apply to most people): When I tried to run the update for the third time (that I believe would have downloaded Receipt), the update program wanted to communicate with my scanner. But I didn’t have it connected. Because of that, it would not install Receipt. It seems that you do need the scanner connected to download Receipt. Thanks for bringing this to my attention. Very neat software. It’s about time Fujitsu came out with something like ScanSnap Receipt. But how easy/convenient is it to scan typically smallish, low-quality receipts using a ScanSnap? How does it compare to using NeatDesk or NeatReceipt scanners? I use an iX500 for Mac. Thanks for the nicely detailed article! I’ve found that lining up the guides to fit the super small receipts makes them scan perfectly. They are also super easy to search. i have the ix500 and a mac in Canada and do not get the update for scansnap receipts. Thanks for the report, Karen. 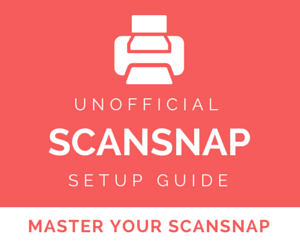 I have purchased your book “Unofficial Scansnap Setup Guide” and found it very helpful. Live in Oregon and did not get the scansnap receipts. I have found an update to it on the Fujitso web site but it says I have to have an earlier version so it can be updated. The scansnap receipts does not look to be included in the US software version. Any suggestions? Thanks for writing. If you bought your ScanSnap in the United States, you should be able to get ScanSnap Receipt by going to Help > Online Update in ScanSnap Manager. You might have to do it 4 or 5 times (crazy I know) before it downloads everything. Thanks for mentioning that it may take multiple downloads to get ScanSnap Receipt. It took me 3. I would’ve given up if it hadn’t been for your comment! I can’t wait to try it. It may not help, but Scansnap Receipts did not show up on my updates until after I downloaded and installed all of the updates for the other software. I just got my update today (Jan 18) – for my ix-500. It appeared unasked for when doing something else. – Also, thanks for this information. I couldn’t figure out how to use it.